*I tried posting this same post at my main blog but the post keeps coming up blank! 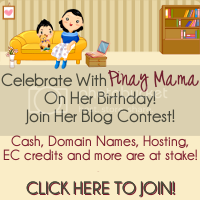 Another blogger is celebrating her birthday with a blog contest, it's Pinay Mama's turn! Consolation Prizes: 4 winners of $5 via random.org for the first 13 contestants who completes the requirements! Special Prize: The contestant with the highest number of referred people to the contest will win a Baby Bond Nursing Sash Couture worth $35.